Representatives of the Bigwood Golf Course made a presentation to the Ketchum City Council on June 16 to gauge interest in whether the city would want to buy the popular recreational site on the north side of town. Financial advisor Sean McCoy and attorney Tom Praggastis addressed the council in order to get feedback from the community and answer general questions about the sale. The entire property is for sale, including the open-space areas, representatives said. The old clubhouse building currently shares a lease with the Bigwood Homeowner’s Association, but the owners may end their lease with the building. The course is currently owned by the family of the late Dave Sellgren, who bought the golf course after moving to Ketchum in 1978. He passed away in 2005 after entering into a lease arrangement with Thunder Spring, a housing and vacation-rental business, in the early 2000s. 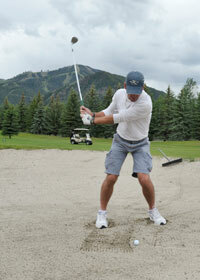 The lease was later terminated and the Sellgren family has maintained control of the golf course for two years. Praggastis said the lack of publicity surrounding the sale is intentional. “The family is entertaining offers, and certainly we have had some interest in the golf course, but at this point we’re not under contract with anyone,” he said. The asking price for the 9-hole course has not yet been made public. Ketchum resident Ed Simon, a former mayor of the city, said at the meeting that he encouraged McCoy to make the presentation to the city, in part because he thinks the price is within the means of Ketchum’s budget. The city is proceeding slowly with dialogue regarding the sale, according to Lisa Enourato, assistant to the city administrator and communications coordinator. She said the city is in a transitory period as they don’t have a city administrator until August, and they are still in the information-gathering process when it comes to details like total acreage and water rights. “I hope that the city will not dismiss this potential win-win for the city, golfers and every Sun Valley and Ketchum resident,” Simon said.